At the end of 2010, Mrs. So & So is getting out of the soap & lotion business. I’ll be focusing my work time on quilting instead. Here is your chance to get any products that you like to use. Send me an email with your order and I’ll fill them in the order received. I’ll try to check in often and keep this inventory status updated. I ship via priority mail. If I know you or you’ve ordered before, I’ll include an invoice in your box in the good faith that you’ll send payment upon receipt. Otherwise, please let me know your paypal email and I’ll send an invoice for you. If you are local, you are welcome to come out. Give me a call first. Thank you for your support of my business over the years. I’ve lost the joy of soaping so it is time to move on. I am excited for the new year and the new adventures in store for us. I’m working on a few finishing touches and a bit more packing/gathering of things for Miss K & her new apartment. Both K & I felt like colds last night. 😦 Of course, all her remedies are already packed but I’m hoping a good night of sleep helped her. Part of my work today is cutting soap. I made 8 batches in a bit less than a week that encompassed last weekend. With all the humdity, they aren’t even setting up very quickly. I usually cut my big block within a day or 2 of pouring and today struggled to cut the batch I poured on 8/20. Frustrating to me! 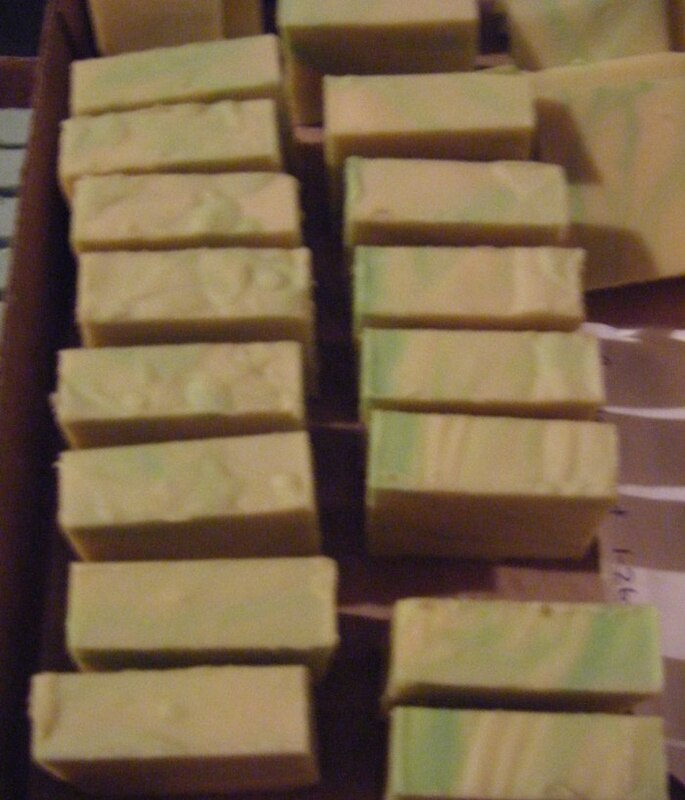 I am really low on inventory so they need made so they can get curing but summer soaping is tough. Most of these fragrances are totally sold out. Hence the need to soap even tho it has been humid! These will be ready the end of September. I move to my show in town on Monday. There are tomatoes to pick for K and I grilled extra meat to share with her since her gas (oven & stove) won’t be turned on until Friday. She has been able to go most nights this past week to clean. She’ll be so happy to be moved! You can also find my etsy shop via the button on the side of my blog. Email me for a current list of soaps in stock. Meanwhile, Phil & I returned yesterday afternoon from our 3 days and 2 nights behind the Cheddar Curtain. Fabulous is an understatement!! Celebrating 27 years of marriage! Wow! Prime Rib at Sebastian’s!! 7 shower heads in one shower! Returning home to find all the animals properly cared for. Topped off by a short nap for both of us and a bonfire with friends! I can’t wait to tell you all about it and show you the pictures. Meanwhile, REALLY hoping the first step in repairing my computer arrives tomorrow! 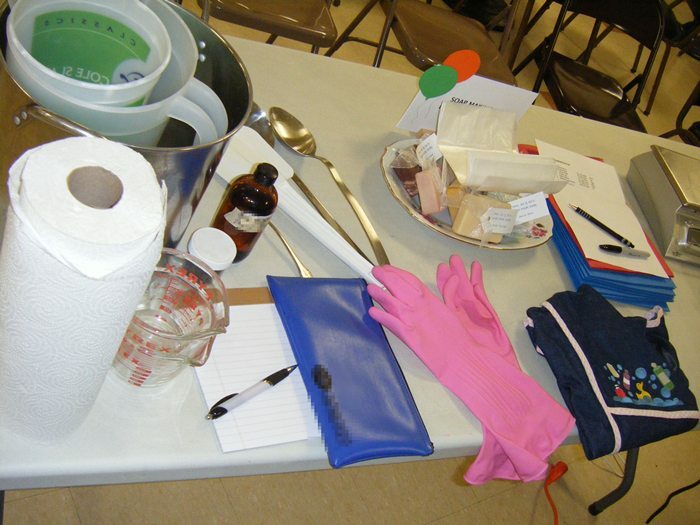 On Tuesday, I gave a demonstration on soap-making. 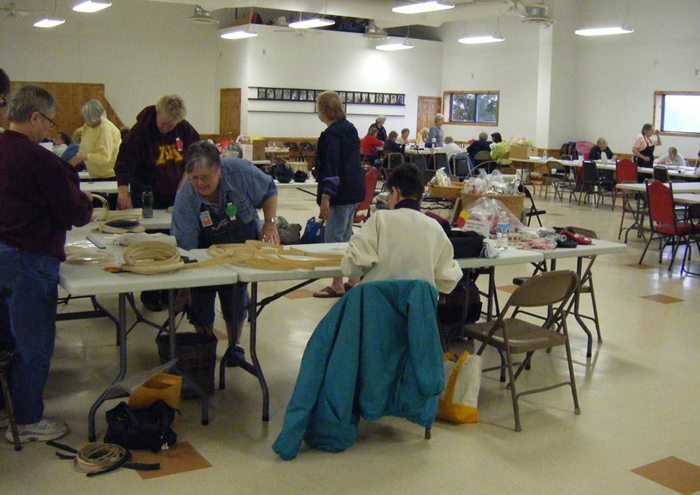 This is an annual Craft Camp Day, sort of like an extension group. Seven ladies took my class and their day was full of various classes. My demo table before class. I had great students! They were interested and asked good questions and took notes. Since my class was the only demonstration and not an actual hands-on for the class, they each got a bar of my soap for their take-home. It is a ton of work to have all the supplies and equipment there so I am glad it pays for itself as well. On Wednesday, I did an inventory of my soaps and checked my etsy site so that is accurate with the fragrances available. I am also been thankful for the sales that happen here at the door. I really need to spend a few weeks soaping. Not sure when that is going to happen! I have 2 batches needing cut now. NOW! Welcome to a new month… but I missed my goal for January. 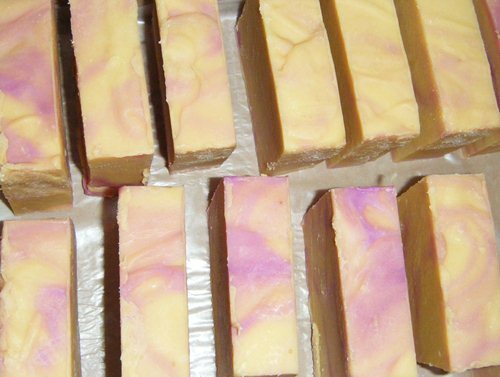 I had good Christmas sales and found myself very low or sold-out on many, many of my soaps! So I made a list and checked my fragrance supply. Some I needed to reorder but some I still had in stock. My list had 15 of my current soaps that needed remade!! That is a long list. I can prep 2 batches at a time so one day I’d get 2 pans of oils and 2 pitchers of lye water ready. The next day I’d mix one batch. The following day I’d mix the next batch. I have 1 batch prepped to mix tomorrow and then I’m at the mercy of the shea butter supplier as I’m out!! Ack!! I know it takes awhile to get but I still didn’t reorder that soon enough. Then I have 3 more on my list to complete. 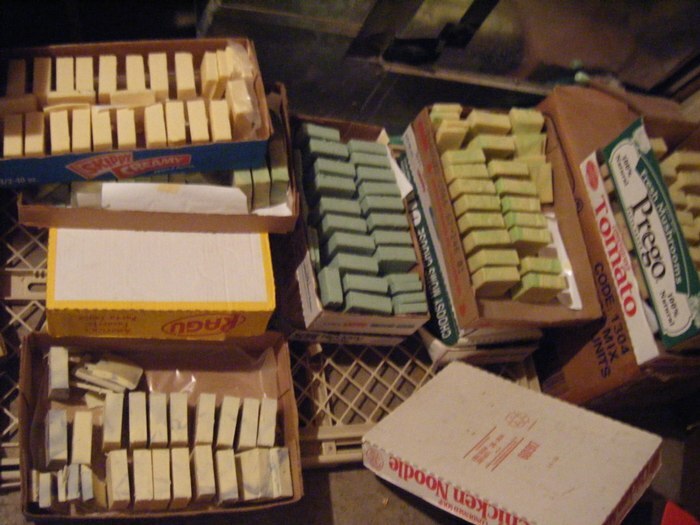 The soap cures about 6 weeks so even the first ones have a bit more curing time to go yet. But all are cut and curing nicely in the furnace room in the basement. I have them in cardboard boxes and covered loosely. Next will be a big empty table to trim all the bars, make labels, and wrapping with ribbon. I mention selling my soaps & lotions at Lynn’s a few times a year so I thought I’d show you what her place is like. This is the front of her house which we don’t use for the sale. 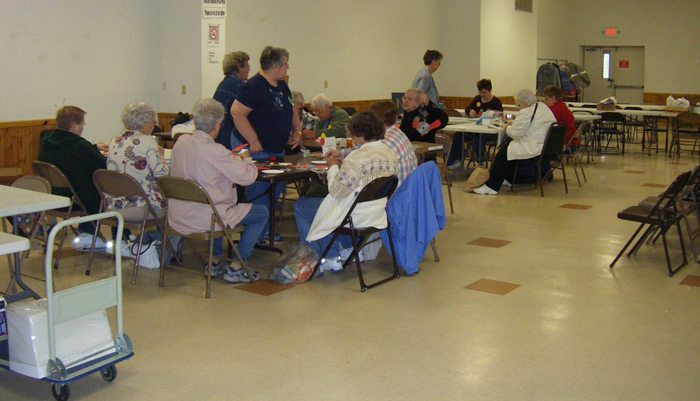 However, this fall she had the Friends of the Library group selling pies, desserts, & drinks on the front porch. I never got a chance to go see it, but she said it was beautiful with their tables & decorations. They did very well and sold out of pies by 2! She sets up a shop in the carriage house behind their home about 4 times a year and kindly lets me (& several others) sell our wares too. In exchange, she gets a cut of our sales and we work a 4 hour shift to help with the check-outs. I love that she lets me use this cabinet for my soaps & lotions! I think her prices are good. A wreath like this is about $32. The big wreath to the left was $55. The small basket (flat with handle) with arrangement on the left end of the white bench was $18. The shop was open this weekend Friday – Sunday and will be open next Saturday. We had good crowds when I worked on Friday afternoon and they were swamped all morning. You Now Have Pictures – Thanks to K! Embroidered denim jacket. It is variations of pink for the flowers and swags. They artfully arranged it on the shelf to show the front & back at the same time! I have yet to figure out why a set of 3 bars of homemade soap are in the canning section but I still play along. Usually I’m the only entry which = $5. Why not? The 2nd place wallhanging is mine in the light batiks. It is 3 paper-pieced stars and hangs vertically with the point at the bottom. I would have to agree the McKenna Ryan all stitched down w/ buttonhole stitch is quite nice and deserves the 1st. We were probably only at the fair an hour. Visited with some friends who were happy to see K and checked on Grandma M’s antique entries.